Slice number 6 of 31! 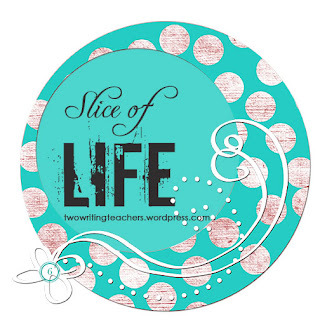 Welcome to the Slice of Life Writing Challenge where we write every day and link together on the Two Writing Teachers Blog of Ruth Ayres and Stacey Shubitz. Even if you don't participate, come visit. 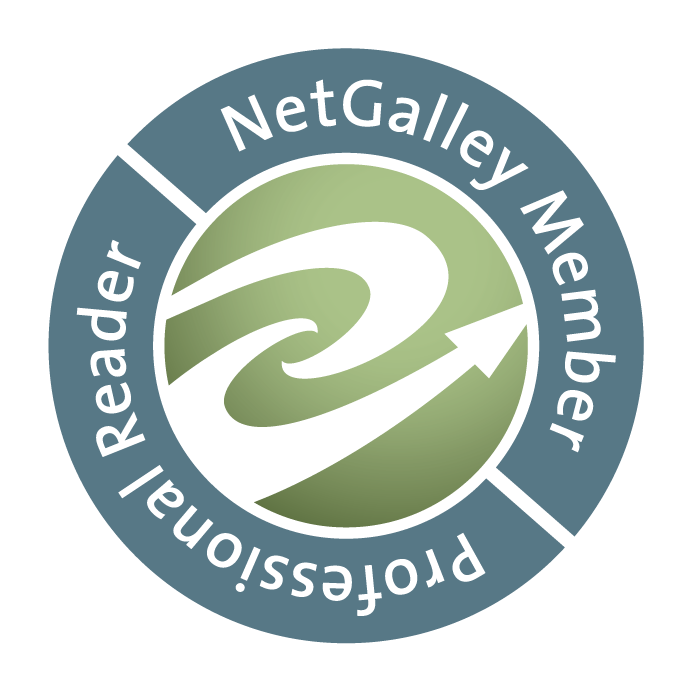 You'll laugh, learn and just have a good time reading! A little more than a week ago we finally had a big snowstorm. We've been in a drought for several years, hence those fires you read about last summer, and any moisture is welcome, even if I do have to clean off my car. I was so happy to have it happen on a day I didn't have to go into work and could play a little in the snow and clean the car toward the end of the day. You hear that I'm rambling. It was that kind of day. I have been so busy for these past months moving, working with workers both at the new house and the old one, managing all the paperwork, etc. that I rarely get to stay home and play. Play can mean many things, but you know that I love the outdoors, so this day I did bundle up and go for a walk, and I did take snow pictures, plus read and make soup. It was the kind of day that stretches like a lazy cat. 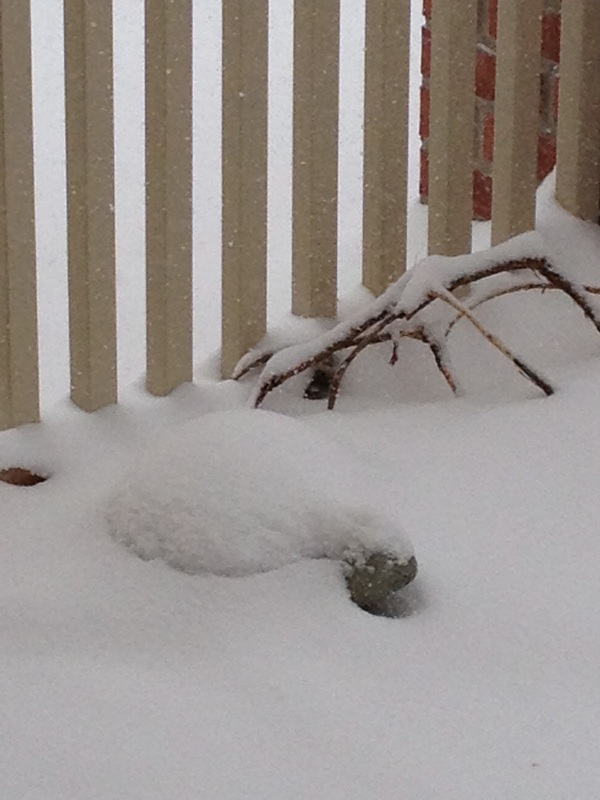 So my sweet slice of life today is the slow storm saga of my garden turtle. 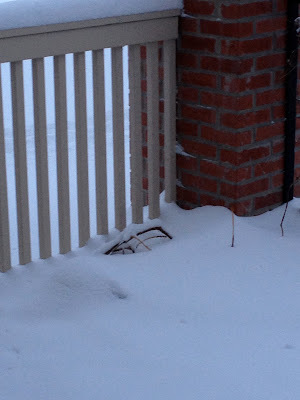 It snowed about twelve inches and I recorded it as you see below, then wrote a little poem. That kind of day! Thinking of the little turtle and his liberation now...too sweet! Thanks Amy! It was a nice, nice day! Thanks Melanie. I am excited to have made the bracket & am now getting nervous! I love your metaphor of the day stretching out "like a lazy cat." Hope the snow makes a dent in your water issues and that your turtle emerges soon! Thanks, he is now appearing again, warm today & snow again Friday. Weather unpredictable in March! Such fun to have a snow day, Karen. I know that those in warmer climates have no idea what we're speaking about! Mary Lee, coming from you that is a big compliment! Your poetry makes me work harder at it! Thank you! I love your writing--both prose and poetry and your photography makes a complete picture. Thanks Deborah, I appreciate the compliment. Love the turtle liberation line! So unexpected! 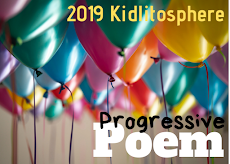 Love your poem and the pictures. My favorite line is "Turtle liberation!" :) Made me smile. Thanks Katherine-fun to watch all during that day! Cool. I just like the whole poem. Each line purposeful. We had a drought here also last summer, and I know we need the moisture, but I'm ready for that moisture to be the kind I don't have to shovel! I know what you mean, Deb. We just don't seem to get much rain at all. Always hopeful! Thank you. Thank you. I'd forgotten about the 'phoems'-perfect word isn't it? I loved that fun little poem! And your line about a day that stretches like a lazy cat. It was such a good day I had to extend the memory, Katie. Thanks! Sun here yesterday and I went out and took some pictures that you will see for the A to Z next month. I think snow is coming later today or tomorrow again. When we had the blizzard I attempted to do the time lapse photos too, but I think I forgot too many, so it wasn't as impressive as your turtle. Wonderful poem to go with it - "briefest hibernation" is my favorite! Let's hope it is! More coming, but the weather people are not sure how much. March is our most mercurial and snowiest month. Spring is on its way! Thanks Donna. What an awesome final line for your poem (and slice accompanied by fantastic pictures). Thanks for that lovely promo at the beginning of your slice, Linda. I do hope people come by to visit even if they're not writing with us yet. You are welcome, Stacey. I hope people do 'drop by'! Thanks for your comment! .. to read and make soup.. something comforting in that. Your pics and poem made me smile. Thanks Terje-one of those lovely days! 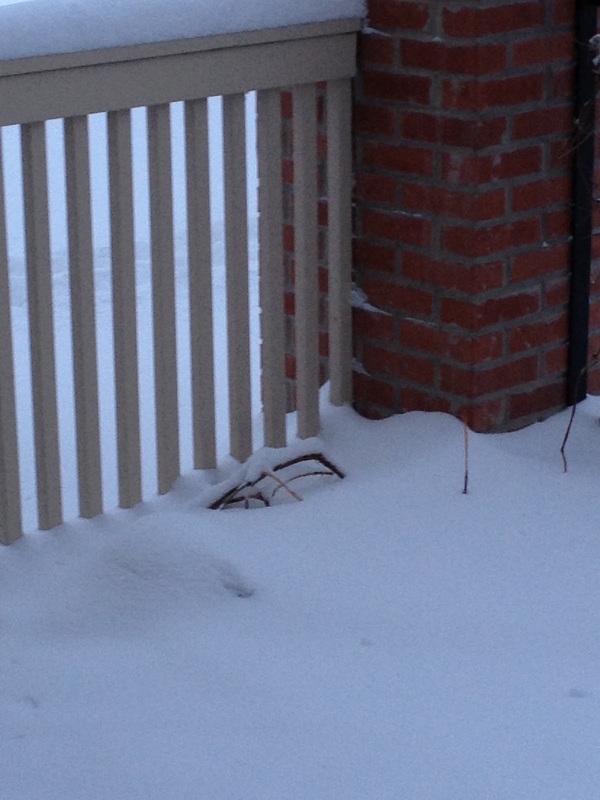 Poor turtle as he slowly disappeared under the snow. Such a fitting poem for the photos. I love how snow forces life to slow down. I guess it doesn't slow much for the snowplow drivers. Everyone's always questioning did they do it right? Other than that-good days. Thanks, Elsie! That was a lot of snow! Let's hope Spring will be here soon, to liberate your turtle and allow for a sun bath! I'm rather excited to see what will appear in my new garden! Thanks, Tara! I feared for a brief moment that he was a real turtle! 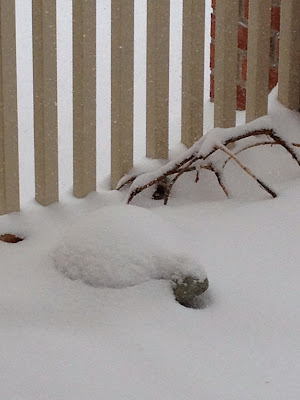 Your photographs are a delightful way to record the snow depths. Love the poem and its concluding "Turtle liberation!" No, no, just a stone one from my grandson. Thanks, Maureen. Great question, Nancy. If you are an introvert like me then you might think hibernation is inviting. Thanks-we would love to send you sun-here right now! It's good to have days like these--slow and easy. The turtle is a perfect specimen for this kind of day even though he's hibernating. I think that agrees with him, too. Pleasant post. Thanks Tam-kind of like canoeing on a lazy afternoon! "It was the kind of day that stretches like a lazy cat"--what a great line, Linda! I hope you enjoyed the snow! Sounds like a great day to me! Thank you Rachel. I did enjoy every bit! Glad you got to enjoy the snow and play. The pictures and poem of your hibernating turtle are too cute. Thanks Judy-we never know what's going to be in the slices, do we? It's just a delight to see what topics people are sharing. Oh, I wish I had known. I sold a few turtles in my sale! I still have one "planter" turtle, but this garden one was given to me by my grandson a few years ago. Very fun to have around! Thanks Jennifer! Loved your poem and all of your thoughtful replies to your feedback! I too had a slow day but didn't realize what a nice day I had until I read your post. Made me step back, sort out the "chaff" so to speak and pull out the treasures in my day...I too got to read, got to make soup, enjoyed a nice conversation with my 20 year old son over lunch, and a relaxing evening with my husband. A nice day indeed. Thanks for the reminder! So nice to hear about your day & that you realized how wonderful it really was. Thank you! What a great record of all the snow you got. Sounds like it was a wonderful day to relax and do what you wanted to. With moving, you must be so busy. Love your poem and just the description of your lazy day. Thanks Beverley. Now I need some more of those days so I can get out the craft table! Isn't it amazing how your perspective on weather is different when a certain type is really needed? Good Question. This snowy day was just right for this day! Thanks! Love it, Linda. What a great poem - and turtle storm saga! I think warmer weather will be our liberation as well. By the way, I loved your "stretches like a lazy cat" line. Thanks Cathy. These are the kind of days that we do remember, aren't they? Ah! Turtle liberation is awesome. I love your little poem and the accompanying timeline of photos. Thanks Betsy! Fun to do it, too! Turtle liberation. That is a line that needs context (like the context you provided with the pics)! It made me chuckle. Thanks Christy-time for some laughs!